Wild rice became was adopted as the state grain in 1977. 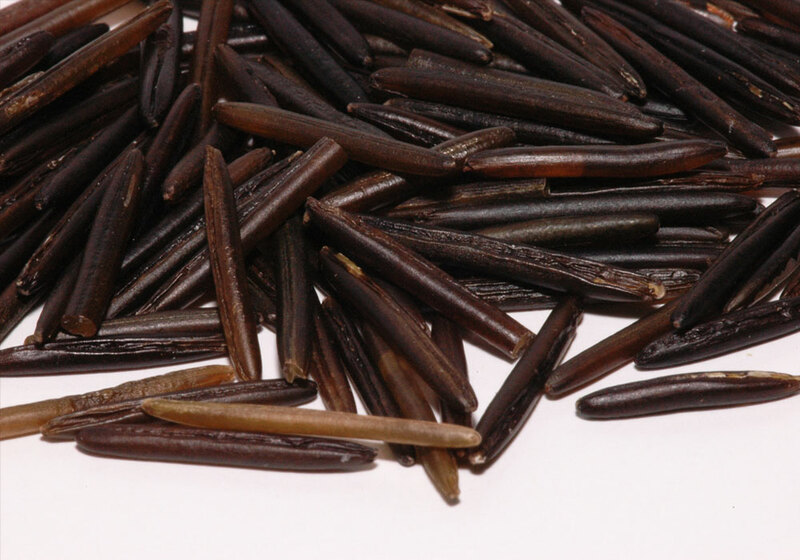 Wild rice (Zizania aquatica or Zizania palustris), called manoomin in the Ojibwe language, has been a staple food for Minnesota’s Indians for centuries. It was adopted as the official state grain in 1977. It is an aquatic grass not related to common rice. Early in the summer, the plants bloom with tiny maroon and gold flowers, and by late summer, their seeds mature into dark brown kernels. Domestic cultivation and combine harvesting of wild rice are relatively recent developments; wild rice is commercially produced as a field crop on about 20,000 acres in Minnesota. For many years, basically all of the wild rice produced in the world came from Minnesota, and most still does. Wild rice often is harvested from lakes in a traditional way, from canoes; people interested in harvesting wild rice in Minnesota must purchase a wild ricing license, similar to a fishing or hunting license. Wild rice grows naturally in the shallow waters of lakes in central and northern Minnesota; the wild rice pictured here, in bloom, was growing in the Island River, near Isabella.